A range of Dormer A120 & A123 HSS ground jobber drills. 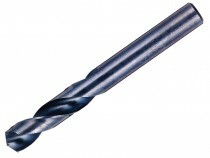 A stub drill bit, widely used in the building and engineering industry for drilling through sheet metal. The Dormer A120 drill bit is made to DIN 1897 specifications, has a 118° drill point up to 2.9mm, a 135° drill point up to 13.0mm and a straight shank.